Background Stroke is a leading cause of disability, but in up to 40% of cases no cause is found. 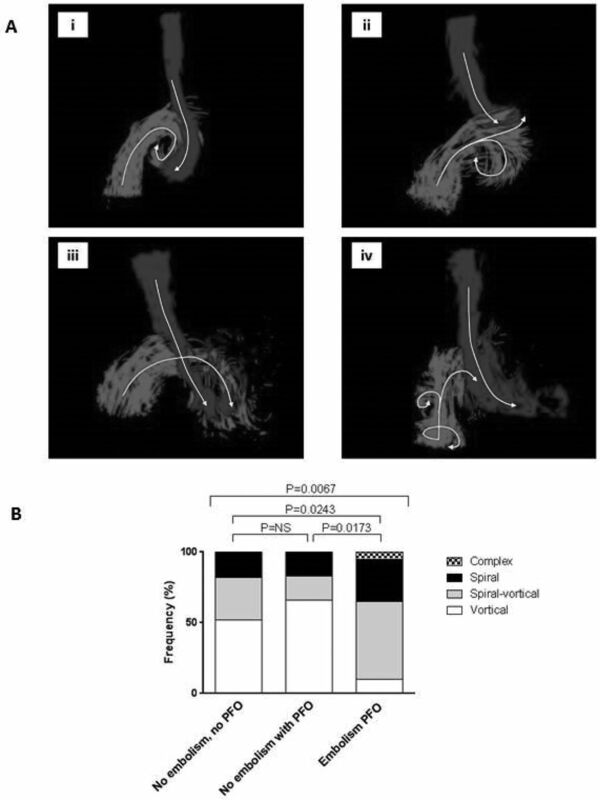 Although a patent foramen ovale (PFO) is an attractive mechanism to explain these cryptogenic strokes, using current imaging techniques, distinguishing between a causative rather than an incidental PFO remains elusive. We hypothesised that, in the presence of a PFO, atypical right atrial (RA) flow patterns would be linked to embolism risk by increasing the shunt of blood, and as such thrombus through the PFO. In order to investigate this we assessed RA flow patterns and interatrial shunt size in patients with a PFO and investigated whether these metrics predicted the incidence of paradoxical embolism. Methods 3 groups were recruited; 1) participants with a PFO but no embolism (n = 12), 2) patients with presumed paradoxical embolism (n = 20) and 3) participants without a PFO (n = 28). All underwent RA 4D flow assessment, and bubble transthoracic echocardiography to determine interatrial shunt size. Atypical RA flow was defined as any flow pattern that was not a classical vortex. Flow Patterns RA flow patterns were similar between the 2 groups with no embolic event irrespective of the presence of a PFO. In the PFO with embolism group, they were significantly different with a higher incidence of atypical RA flow (P = 0.0067, Figure 1B). Risk of embolism When considering all the subjects with a PFO (n = 32), the presence of an atypical flow pattern was 11.5 times more common in those who have had an embolic event (P = 0.002, Fisher’s exact test). To explore whether this effect was mediated by changing the degree of shunting, moderated multiple regression was performed. This showed that flow patterns were related to shunt grade (a pathway, β 34.0, p < 0.01), and that shunt grade was related to embolism incidence (b pathway, β 0.08, p < 0.01). As the a and b pathways were significant, mediation analysis was tested using 2,000 bootstrap resamples to generate a 95% confidence interval (bias corrected) of the indirect effect. 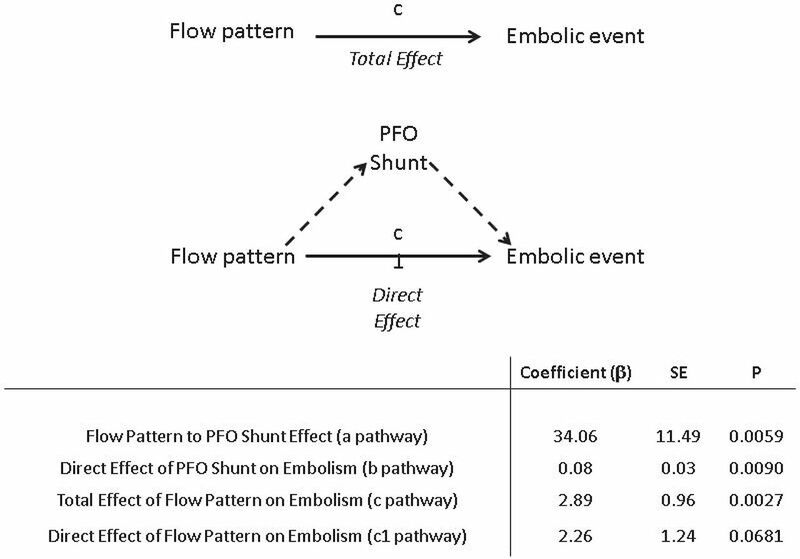 This showed that the effect of an atypical flow pattern upon an embolic event is indeed mediated by increasing the shunt across the PFO (CI 0.45–18.42, Figure 2). As the direct effect of flow patterns on embolic risk becomes insignificant (c1 pathway, p = 0.06) this suggests full mediation. Conclusions Patients with a PFO and atypical RA flow pattern were 11.5 times more likely to have had an embolic event. This increased embolic risk seems to be mediated via increasing the shunt size across the PFO. As a result, not only will identification of the presence or absence of RA classical vortical flow in individuals presenting with a cryptogenic stroke help distinguish a causative PFO, but it may also identify patients with a PFO who are at elevated risk of future embolism.